MusclePharm Assault Review – Is it worth the price? MusclePharm is a supplement manufacturer known for its lucrative endorsement deals with big brands such as the UFC. MusclePharm introduced its Assault™ Pre-workout supplement that promises to generate results safely. For many consumers who are concerned about using unsafe products, MusclePharm Assault may give them the peace of mind they are looking for, but how does being safe affect the performance of the product? Many supplement users have adopted the idea that if it’s dangerously potent, then it must work. Was MusclePharm Assault able to find a perfect balance between risk and reward? We took MusclePharm under the microscope to see if it can live up to its promises. According to MusclePharm, Assault contains an energy-boosting mix that will power anyone past physical or mental fatigue through the use of its Energy and Neuro Igniter. MusclePharm claims that its energy profile can provide rapid bursts of energy shortly after taking the mix. Assault’s Energy and Neuro igniter creates a collaborative effect that should give the user enough energy to sustain intense workouts. Critical reviews about MusclePharm typically involve complaints about how MusclePharm isn’t living up to its promise of an explosive energy boost when working out. Like many products that contain a caffeine-like stimulant, the first thing users experience is the changes in their alertness. However, the alertness effects quickly die out, leaving users with a sharp decline in energy. Reviews about MusclePharm also involve complaints about the product itself and how difficult it was to mix the powder. The powder gathers moisture quickly, and some tubs that were shipped had completely solidified powder probably because of the moisture. The taste of the mix also concerns users because many find the flavor to be too sweet. The good thing about MusclePharm is that it held its end of the deal when they said that MusclePharm Assault does not contain any banned substances as defined by various governing bodies of sports. Despite declaring its war on stimulant-based supplements, a lot of customers would find it ironic that MusclePharm Assault also has stimulants like every muscle enhancement supplement in the market today. 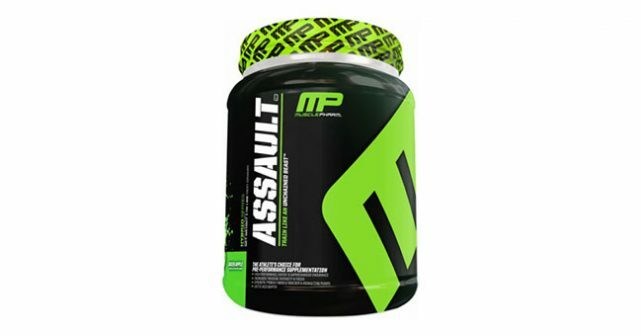 MusclePharm Assault also contains strong artificial sweeteners like Acesulfame and Sucralose. Acesulfame is 200 times sweeter than sugar, and that may be the reason why many customers find the mix too sweet for their taste. Acesulfame is also a dangerous carcinogen if taken regularly over a period of time. MusclePharm Assault may be a great idea for Athletes who are concerned about getting a hit on sports doping tests. Other muscle enhancement supplements also contain the active ingredients in MusclePharm assault, yet they do not build their whole marketing campaign on it. For most supplement manufacturers, being straightforward with their ingredient list makes their product more credible and convincing.